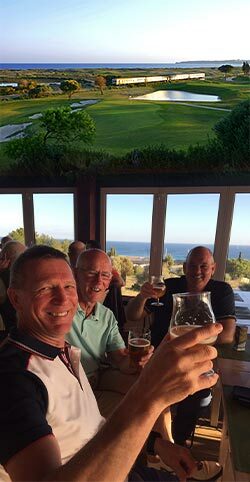 Golfers at Palmares Beach & Golf Resort, in the Algarve, raised a collective glass after winning an important battle in the war on slow play. The stunning five-star resort in Lagos, which boasts 27 holes, is keen to make its latest tournament –Eradicate Slow Play – a regular event after a successful debut. As well as introducing the new R&A rules and recommendations, which are designed to speed up play, the philosophy behind the event was embraced by the participants – spurred on by some radical local rules to act as an extra temptation to complete the nine holes of Texas Scramble as quickly as possible. One incentive in particular – the prospect of free beer in the clubhouse up until one and hour and 45 minutes after the shotgun start – certainly did the trick for the winning team from the UK as they toasted their success. It meant Brad Walker, Steve Smith and Derek Sanders – with an average age of 62 – enjoyed an hour of quenching their collective thirst with complimentary hospitality after tearing round nine holes in just 45 minutes. Although their score was immaterial, it was still impressive as they posted a one-under-par gross total, while their nearest challengers joined them at the bar just a few minutes later after posting times of 50 and 55 minutes respectively. Aside from other incentives of replacing all lost balls with a brand new sleeve, the threat of punishment also served its purpose with one-shot penalties handed out for: searching for lost balls, practice swings, hitting provisional balls or reading greens from both sides. The resort’s operations director, António Pinto Coelho, believes the tournament will now become a fixture at the multi award-winning course, which was extensively redesigned by Robert Trent Jones Jnr in 2011. He said: “It was a big success. Everyone got into the spirit – especially with a complimentary shot of Medronho before the start. It was just a great time and got back to golf being fun. “Most people said playing faster made them have more fun and didn’t affect the final score – not that the score mattered for this tournament. The Onyria Golf Resorts group is part of the natural evolution of a project that began around 25 years ago. The group was created to undertake the integrated management of resorts, villas, hotels, golf courses and restaurants. Onyria Golf Resorts is a family enterprise and began in 1985, with the acquisition of a plot of land in the Quinta da Marinha, Cascais. Current and future touristic investments include various projects which are always situated in the most privileged locales: exquisite locations devoted to relaxation, but with the added advantage of always being close by to urban centers. Onyria Golf Resorts has developed golf, business and pure leisure oriented projects at Cascais (Hotel Quinta da Marinha Resort) and the Algarve (Onyria Palmares Beach & Golf Resort). High-resolution imagery of Onyria Palmares Beach & Golf Resort can be downloaded, for editorial use only, from here, for Quinta da Marinha from here, and for the Onyria Palmares Beach House Hotel here.